Win Don't Worry, He Won't Get Far On Foot: Joaquin Phoenix's dramatic transformation | SWITCH. 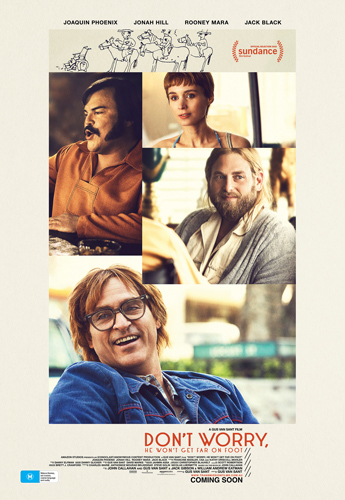 After Portland slacker John Callahan (Joaquin Phoenix) nearly loses his life in a car accident, the last thing he intends to do is give up drinking. But when he reluctantly enters treatment - with encouragement from his girlfriend (Rooney Mara) and a charismatic sponsor (Jonah Hill) - Callahan discovers a gift for drawing edgy, irreverent newspaper cartoons that develop a national following and grant him a new lease on life. Based on a true story, this poignant, insightful and often funny drama about the healing power of art is adapted from Callahan’s autobiography and directed by two-time Oscar nominee Gus Van Sant. The 'Don't Worry, He Won't Get Far On Foot' competition has now closed. Winners will be announced shortly. Competition opens at 5pm AEST on Sunday 16th September 2018 and closes at 11:59pm AEST on Sunday 23rd September 2018. Five winners will be chosen at random on Monday 24th September 2018. To successfully win, entrants must fulfil the above entry conditions before the time the competition closes. Current members/followers are eligible to enter the competition. Only one entry per person. Only one winner per household. To be a valid winner, the entrant must not have won a prize from SWITCH within the last 28 days. Each winner will receive one double pass to 'Don't Worry, He Won't Get Far On Foot'. By entering, you agree to receive occasional emails from SWITCH in the future. If you decide to unsubscribe from these updates, any further entries will not be applicable. Only Australian residents are eligible to enter. 'Don't Worry, He Won't Get Far On Foot' is in cinemas from Thursday the 27th September 2018 through Transmission.